PREHEAT oven to 350°F. Spray both sides of Tortillas with cooking spray, then place in a single layer on baking sheet. Bake 10 min. or until crisp and lightly browned. COOK and season meat with Taco Seasoning as directed on package. 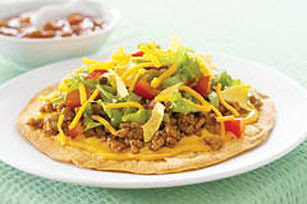 TOP each tortilla with with meat mixture and lettuce. Crumble 1 Taco Shell over each tostada; top with tomato, cheese and salsa. *Definetely add your favorite tao toppings to this too- olives, onions, green onions etc.